This is something of a continuation of my last article, with a whole new perspective. You may remember I wrote about a book called Extracted – How the Quest for Mineral Wealth Is Pillaging the Planet. Since then I’ve “met” The Shock Doctrine author Naomi Klein and bought her latest book from her. That one is called This Changes Everything and it’s about what climate change implies about rearranging our economics and politics—and more than that, maybe our trajectory toward ecological and political collapse on our lovely, rich and vital planet Earth. Emphasize this: collapse means essentially the death of practically everything we hold near and dear. Well, that didn’t go over very well. As I wrote in my last article, those who thought infinite growth of everything economic on the finite Earth is the only measure of health (which are close to all university-trained and business and government employed economists) immediately bared down on anyone who would dare predict collapsing resources and systems in the 20th century. The only problem was that “Limits” said it would happen in the 21st century not the 20th. “Don’t panic quite yet, stupid. Re-read what we wrote” was the implied message to the climate deniers and fossil-fuels-till-they’re-gone pushers. 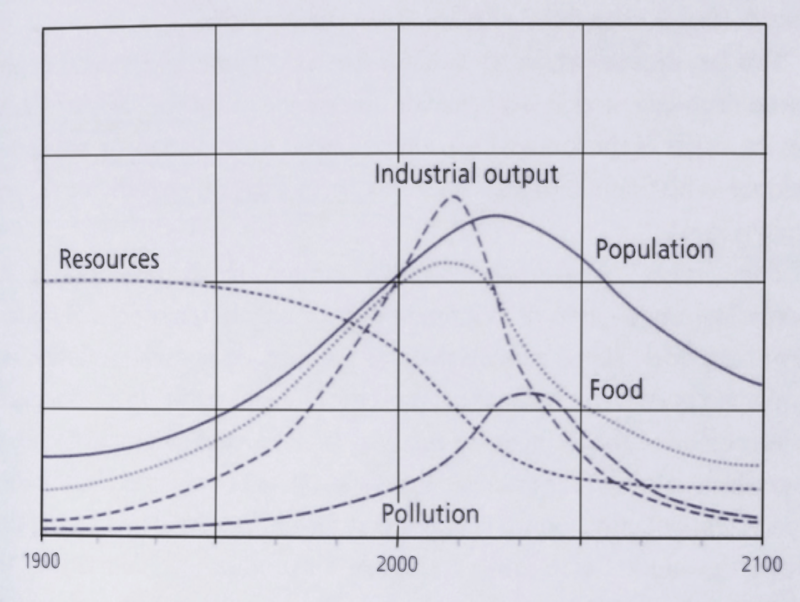 These problems [of resources collapse, climate change and mass extinction] can’t just be boiled down to the perils of “running out of something” or of modest increase in atmospheric temperatures. Instead they represent a complete transformation of the whole Earth’s ecosystem, generated by the human influence on the planet. So the call to action urged in the 1972 Limits study is becoming more and more urgent. But now it’s 42 year later and time to panic. Enter Naomi Klein. She was delivering a talk in Berkeley on the evening of the 29th of September. Her basic thesis in This Changes Everything and in her talk was that climate change is so dire we need to unite in ways we never have before across political and economic lines, left/right political affections and habits. Without abandoning her critique of capitalism, central to The Shock Doctrine, she in her new book and that night emphasized that socialists have been as severe in exploitation of nature as anyone else. Now is the time to do things radically differently if our children are to have much of a future. My earlier “panic” remark may hopefully turn out to be just a call to wake up to a few more possibilities than she has cited, some of them heartening. I think there is more positive there than even she has grasped for or found potential for in This Changes Everything. There are some perspectives that add a great deal to the positive side of a dangerous future. 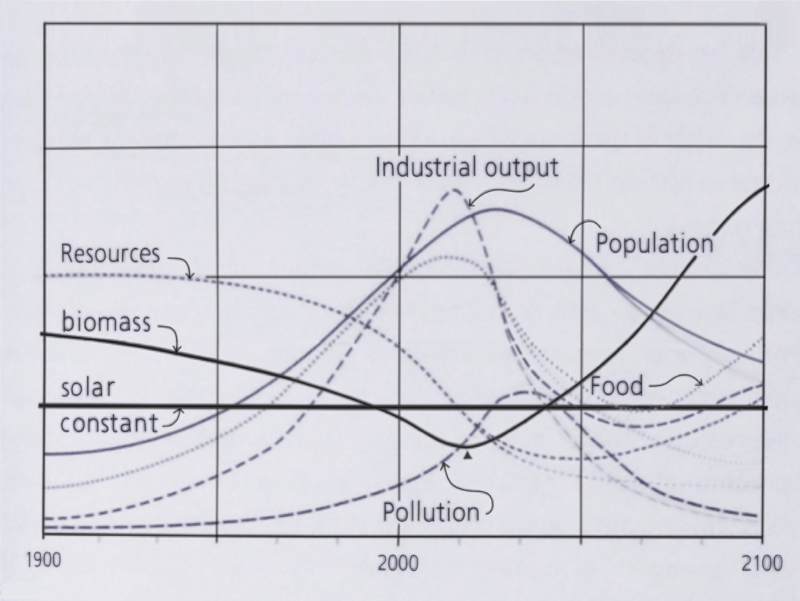 In my last article I mentioned, in the same spirit, that the graphs produced for the 1972 Limits to Growth didn’t include the massive and constant arrival on earth of a constant flux of energy from the sun that powers, through chlorophyll in plants, the entire enormously productive biomass of the planet. With the kind of solutions suggested by the Limits authors and her suggestions too, plus a few things I’ll shortly mention that they both miss, we may have a little better chance than otherwise. The “mention that dismisses” I’ve noticed in planning (and design) public policy debates is the tactic that mentions a subject in public process but only in passing. Later if anyone says, “You didn’t even discuss this angle, option, policy or whatever,” the answer is, “Oh yes we did. Remember on the second day of the conference Howard brought it up in the third breakout session in the track dealing with bicycles…” or the like. Now the near silence on the subject is democratically justified and proven. I’m sure, having now read This Changes Everything – a brilliant title I think, by the way – that she doesn’t intend to be dismissive of the subject. She just hasn’t paid much attention to it. And I also believe that she is right in using climate change as an opportunity to unite people of different political theory and economic persuasion. But she is lacking two important tools that could help her campaign to wake us up and get us on the track to the survival and resurgence on a healthy planet. They are the notion of the ecocity and the notion of exaggerated gamesmanship in economics and politics. I should mention at the outset of explaining these concepts that Naomi Klein does cover solar and other renewable energy systems as crucial in solving climate problems and, later down the line, in uniting us all in a common cause of survival and renewal. She also covers the span of what was called in the 1970s “appropriate technologies” of recycling, conservation, organic farming and so on. And of course she deals with the positives in reducing the radical injustices of extreme inequality among us humans in terms of income and wealth. But she, as well as the Club of Rome, almost totally misses city and town design, layout and planning. Missing the largest thing humans create… well that’s a problem. The ecocity represents what we build and implies also what we build with: whether it destroys much of the surface of the Earth and contaminates the atmosphere, causing climate disasters, or not. Maybe it doesn’t even need too, so severe is the threat of mineral depletion and resulting poisoning. What we build with includes the minerals that turn into steel, concrete, glass and cut, sawed and constructed wood, and the entire supply chain of tools, fasteners, chemicals, paints and other coatings, machines, technologies, policies and habits that bring us our current sprawled out, car-dominated cities, towns and villages. In addition to the stuff of it all, the mineral/material stuff, there is the massive project of mining fossil fuels and burning them up to animate it all. All this represents an economics and civilization based on massive use of material and energy from non-living, but, regarding energy, once-living sources. What ecocities imply by using the model of living organisms in their design and construction is an economics and civilization that recognizes the natural origin of all the above. That is, the minerals cooked up in exploding early stars and the energy from the sun powering chlorophyll. That investment alighting on Earth as nice, wholesome, everyday sunshine created the organic matter that became fossil fuels during the last 500 million years. But that complement of coal, oil and gas fuels we are burning up in just 200 or 300 years. We humans will always need to use energy from somewhere. We could recycle most of our mineral wealth pretty much endlessly. But we need to wean ourselves from the diet of pass-through mineral and burn-it-all fossil fuels (and no doubt the radiations-soaked nuclear option) early history habit. That accomplished in our childhood, and over several generations if we pull it off, we will discover ourselves in a civilization based instead of the sun, plants, chlorophyll and only a very small component of non-renewable energy sources, if any such sources at all. We can use wood and biofuels, and other organic sources to make plastics and other amazing articles for a materially creative and compassionate civilization. We can still make concrete with solar energy and recycle lots of steel. And we will. If we don’t, we’ll radically impoverish the planet and possibly eliminate people along with the ever-lengthening list of plants and animals we are driving into extinction. To attain such a biology-based civilization running on the sun’s gift to the Earth we will need to do a suite of things seen as a whole-systems solution of several parts. Without elaborating here, these solutions involve curbing and gradually reducing our gigantic population by intent rather than collapse; re-imagining and reorganizing agriculture to be far more organic and far less based on chemicals; and intensive use of energy, tweaking nature’s own processes of sequestration of carbon into soils and sediments, a strategy I call “natural carbon sequestration.” We’ll have to make deep investment into giving back to nature, recognizing how it has given us life and sustains us still as bad little children, most of us trying to grow up, and promising us, if not too abused by us, to continue giving us… everything. Of course in Ecocity Builders and its circles we feature the reshaped city, the ecocity, as a indispensable part of the strategy. Those familiar with us know we mean the ecocity as the compact, ecologically healthy city, with its essential parts close together for efficient and productive functioning. Think renewable energy, energy conservation, pedestrian and bicycle and transit design, building soils with organic wastes and preserving and revitalizing biodiversity and that’s most of it. We all love games. But they can get out of hand. The implications of this simple principle are profound, I believe, in terms Naomi Klein should know about since she is so deeply aware of and concerned about economics. The economic implications are immense. The competition between what is often seen as capitalism and socialism squaring off against one another ends up in endless injustices. It often leads to wars, cold and hot, assassinations, and slander to kill reputations and keep many would-be contributing good people marginalized. People like games. There is no problem within reasonable limits. The problem comes when the competitions get more extreme. We seem to like the entertainment value of the more extreme. We have a weakness for flirting with danger while disproportionately respecting the skills of winning games. The best of the best in games become heroes throughout whole cultures and when it gets to economics and politics, there is nothing like a little violence once in a while to really get attention. Think Putin invading and annexing the Crimea coinciding with his meteoric rise in popularity to over 85% positive rating among Russians. Similarly, notice almost nobody in the Congress of the United States standing up to even discuss the Bush/Cheney invasion of Iraq based on what practically every one around the world, from UN weapons inspectors on the ground down to the citizen in the streets of the world, knew to be lies. Getting a little deeper we can notice two very basic kinds of games and James Carse writes about them in a book that names them in its title: “Finite and Infinite Games.” He makes the point that games are activities we engage in voluntarily (or else they are not games but assignments). The finite game has rules and an end point, with a winner and loser at that point. We agree to those rules and jump on in. If we win, nice prizes from material ones to ego boosting ones, reward skill or luck. If we lose, we are free to try again. In business, academia, professions, arts and politics you want to keep winning until “success” is yours, usually measured in wealth but sometimes status, honor, reputation, or some mix of the above. The object is finality, knowing what’s what, and winning. The infinite game is one in which the players are free to change the rules while playing and the objective is not to conclude but to keep the play going forever, throughout life. Since human lives overlap some of us play that game deep into the future, perhaps hoping to create the Third Reich that will last a thousand year, the American Millennium, everyone converted to Christianity or Islam, or maybe a healthy future on Earth enduring, and enduring and enduring. The infinite game is still a serious pursuit even though rules change; they have to change by persuasion and agreement or it’s not a game because a game has to be played by volunteers, not slaves. Here’s where it gets interesting in Naomi Klein’s world of economic and political thinking: capitalism vs. socialism is a game of two sides. People play one emphasizing the individual as the highest attainment of evolution or God’s product to date – capitalism. The other says the collective is of highest value, that society progresses or sinks together – socialism. Capitalism believes in free markets as the most holy thing. Socialism believes in regulation and planning for the common benefit as most holy. Creativity and hard work on the part of the individual to produce something to sell to the public justifies capitalist theory when the capitalist offers something the people like, want and buy. Thus, in capitalism, self-interest is the best route to the common good. However, socialists criticize, the material wealth generated by capitalists can accrue toward monopoly. The rich abuse workers and burn up too much of the world’s resources without sharing them. The individual capitalist uses his wealth to buy off those who might criticize by reducing their pay. So let us make the rules that share, the socialists argue. Both sides are right and both sides are wrong. There is nothing wrong with being a decent capitalist offering a product or a service and taking a reasonable profit. And there is nothing wrong with insisting that we all share more equitably in both the rewards and in the deliberations leading to public policies regarding the economy. Capitalists worship the market. Socialists honor regulation. Both are needed, otherwise society is like a car careening forward (the power of the market to set prices and function smoothly) on the power of its engine. But without the guidance of the person at the wheel and the action of the breaks, if those functions are not performed, expect a crash and soon. And in fact that’s exactly what happened when capitalism crashed in 1929 and 2008 and “socialism” bailed it out in the form of government policy decisions and gigantic loans, interest adjustments and other banking moves. In the aftermath of 1929 that’s probably what saved us from fascism when most of the rest of the world thought it looked reasonable as a means out of a real jam. Where both sides are wrong is in the exaggerated importance they give to their side of the pair of actions needed to progress. Both engine and breaks, forward energy and proper guidance and regulation, what capitalism and socialism champion, are needed. The only trouble is, among finite gamers, you can’t get much more than ho-hum from the audience if you don’t pretend your side is superior and you turn cooperation into competition, and even better, real conflict. You can’t win the attention of those who might advance you in business, politics or elsewhere, or even those who might want to marry you, if you don’t get a little attention for the way you play the finite game. And only if you occasionally win and in general display your skill in the game. Get a little fanatic and absolute about your game and you can become a demagogue or the worshiper of a leader who is an exterminating angel in some religion or philosophy that insists on winning in a finite game that’s actually deadly: killing the opposition. Exaggerated gamesmanship can, and frequently does, lead to war. Exaggerated gamesmanship in economics and politics is played within something that could be called capital economics. That’s capital economics, not capitalist. First principle here is that our human-created economics are completely based on nature’s economics, and on earth that means dependent upon the sun, minerals, water from rain to oceans, air and biology of the planet. Early human economics appear to be gift economics in which the family or small band shared whatever was taken from nature. The first gift: mother’s milk to children. Then there was generally the man (somewhat specialized for the task) defending, killing game and bringing it home to share, and the woman engaging in foraging from nature and more dominantly transforming nature into artifacts and products on the home front. Enter “the artifact list.” My first real job, when I was sixteen, was digging up Native American ruins with the Museum of Anthropology of New Mexico in Santa Fe. Out there in the mountains, forest and dry valleys, the culture that disappeared about 1,000 years ago produced a rather short artifact list. It consisted of bows and arrows, articles of clothing, tools for digging and scraping, the pit houses they dug and covered with logs, branches, twigs, leaves and dirt and lived in part of the time. Their fired pottery was the high tech of the time; their herbs, their medicine. And there was little else. Their artifact list could be written down on a single side of a single sheet of paper. The artifact list of our material culture today includes so many things it would be impossible to physically lift and carry a complete book bearing the list. It would be too heavy. From Boeing 747 jet airplanes down to a tiny specialized screw. Those are two artifacts I choose to mention right now because I am on a 747 heading from China, where I was lecturing about ecological cities. Yesterday as the plane sat on the tarmac (an artifact) still attached to the jet way (another artifact) the captain announced over the in-plane speaker system (another artifact) that two gaskets (other artifacts) had been discovered to be loose and we needed a couple of screws (artifact) to fit where two had mysteriously disappeared before we could take off. United Airlines didn’t have the spare two screws but China Air did. So, the captain told us, we were in the process of negotiating to buy the two screws. Maybe we could pull it off. They did – sort of. But a mechanic apparently stripped one of the screws during installation. Anyway, for one screw (another artifact) or the pieces it was supposed to secure (two more artifacts) the entire flight was canceled and more than two hundred of us clamored onto two buses and a fleet of taxis and crossed half of Beijing to a hotel for the night and started all over again the next morning. Now I’m in a plane I hope has a good screw (artifact) holding the engine casing parts (two artifacts) together. The meaning of all this is that the length of the artifact list is in some sense proportional to the size of the cities we create. The longer the list, the more people required for producing a variety of things, the larger whatever houses them—and that “whatever” is the city. Are they too big? Definitely the artifact list today has a massive quantity of nonsense items on it for useless entertainment (appropriately called “distractions” sometimes) and even many things designed explicitly for destruction: guns for police and criminals (as well as a few subsistence hunters), and airplanes, drones, bombs and warships to make sure our side is successful in securing the fossil fuels needed in the exaggerated gamesmanship of international economics—what Winston Churchill often frankly called dominance. So… I offer the idea that gamesmanship is fine and entertaining within limits, but, as in infinite growth economics, when rendered extreme is extremely nasty in its implications. Maybe we should relax a little and think about what on our artifact list is really relevant to a healthy future. Could we play the capitalist/socialist game a little more reasonably? We will always be bickering about what is fair, as it will always be that some people contribute more than others to the social well being. But should we make such a big deal of it that some starve and others kill each other? The capitalist/socialist back and forth will always exist in terms of more or less for either of the two sides of the market/regulation balance, which is just fine. Back and forth can be like a dance and a pleasurable game between opposites, like partners swaying and flying about drenched in music. The my-religion-is-better-than-yours, or my-country, my-race… Well these things can get pretty destructive. But with a little tolerance turning into appreciation for difference it can be pretty wonderful. Is Naomi Klein right to say the climate change situation gives us a larger issue to understand, a larger, survival issue even to unite us all, including the other animals and plants on the planet? Yes. Let my two charts try to speak for all this as a closing of this article. My version of the graph, with biomass and the solar constant added.